Are Psychiatrists Hesitant To Say Bad Things About Their Peers? 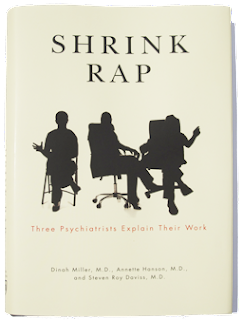 When Jesse read our Shrink Rap book, he said we were too nice to psychiatrists in it– that we didn’t mention that there are some really bad psychiatrists out there and he thinks part of the venom towards psychiatry comes from the whole rushed 15 minute med-check culture. The authors are careful to include what might be called opposing views. They give some space to the anti-psychiatry movement, and they consider the recent cases of medications that seem to cause suicidal thinking in some patients. But they balance that against the suicidal thinking that is prevented in some other patients by the same medications. They also talk about the influence of drug companies in a fairly open way. There are no heroes here. The authors aren’t in the business of justifying themselves, and one or two of the fictional therapists we see in the book do spectacularly bad jobs and harm patients. Gardiner Harris had a [recent] article in the New York Times called “Talk Doesn’t Pay So Psychiatrists Turn to Drug Therapy.” The article is a twist on an old Shrink Rap topic, “Why your Shrink Doesn’t Take Your Insurance.” Only in this article the shrink does take your insurance, he just doesn’t talk to you. Chronic Fatigue Syndrome: Can Psychotherapy And Exercise Help? The new study, conducted at clinics in Britain and financed by that country’s government, is expected to lend ammunition to those who think the disease is primarily psychological or related to stress. In the long-awaited study, patients who were randomly assigned to receive cognitive behavioral therapy or exercise therapy, in combination with specialized medical care, reported reduced fatigue levels and greater improvement in physical functioning than those receiving the medical care alone — or getting the medical care along with training in how to recognize the onset of fatigue and to adjust their activities accordingly. Interesting. Generally I like to stay away from the “it’s all in your head” debates. I’ll let the commenters do the talking here. I read today that Eastern Ontario has started a bed registry to keep track of where open psychiatric beds are available. This is something I’ve long advocated. The United States now has less than 10 percent of the beds it used to have 50 years ago. Granted, treatment has improved and community resources are enhanced. But there are still areas that often do not have a sufficient number of hospital beds for folks needing acute inpatient psychiatric care. The Ontario story described in the Ottawa Citizen states that six of the area hospitals have been connected to a computerized “bed board” that provides real-time information on who has an appropriate bed available. This saves time in the ER and gets patients to needed treatment more quickly. Otherwise calls need to be made to each individual hospital, which is very time-consuming. And it’s not uncommon for all the beds to be full. Last July there was an EMTALA complaint against a hospital in Maryland because a patient sat in the ER all weekend, and this hospital said they had no beds to admit the patient to. The Department of Health and Mental Hygiene (DHMH) investigated the complaint and found that indeed the hospital was full that weekend. The ER’s record indicated that all the hospitals (except the state hospitals) were called that weekend and all indicated their beds were full. So DHMH visited every hospital (about 28, I think) thinking that surely one of them had an empty bed they were hiding. What they discovered was that every single psychiatric bed in the state was full. Unfortunately, we have no way of determining how often this happens, but we know if happens often enough. A “bed board” like this would be very helpful in quickly finding beds when needed and keeping track of the extent of this problem. Having patients wait in ER for days is unsafe and is even discriminatory. How many people with stroke or uncontrolled diabetes sit in ER for days waiting to find a bed for treatment? I’d like to hear others’ thoughts on how this problem can be addressed. Electroconvulsive therapy (ECT) is considered to be a highly effective treatment for depression. The story goes that roughly 90 percent of patients respond. The downside is that it requires general anesthesia with all its attendant risks, and patients may suffer from headaches and memory loss. The memory loss is often mild, but there are cases where it is profound and very troubling. As with any psychiatric treatment — or so it seems — there are those who say it saved them and those who say it destroyed them. Because the risks aren’t minor, the procedure is expensive and often done on an inpatient unit, and people generally don’t like the idea of having an IV line placed, being put under, then shocked through their brain until they seize, only to wake up groggy and perhaps disoriented with an aching head, it’s often considered to be the treatment of last resort, when all else has failed. This makes the 90 percent response rate even more powerful. I’m no expert on ECT. I haven’t administered it since I was a resident and I don’t work with inpatients where I see people before and after. I’ve rarely recommended it, and then I’ve been met with a resounding, “NO.” My memory of it was that it worked, and that most people didn’t complain of problems. One woman read a novel during her inpatient stay. I asked if she had trouble following the plot (ECT in the morning, novel reading in the afternoon), and she said no.